When I was last down at the beer store not alot was catching my eye, so I asked the guy what's new and he recommended this Fijian lager. He also said it's pretty good, so I chucked it in the fridge and tonights the night to have it. This is actually the only beer brewed in Fiji, the countries main beer Fiji Bitter is actually brewed in my home city of Melbourne at Carlton United Brewery. I find it slightly unusual that we can get this Fiji brewed lager in Australia but can't get Fiji Bitter even though it's brewed in Melbourne... It seems odd but that is one of the reasons I love the world of beer. Once I poured this beer I was instantly doubting the recommendation. The colour of the beer is a yellow/gold colour and it seems to have plenty of carbonation. That's all fine, however you then see the head or the lack thereof... It's no more than four bubbles high of white head on top of the beer at first, the rest of it disappears within maybe 30 seconds of being poured. It's very average looking. 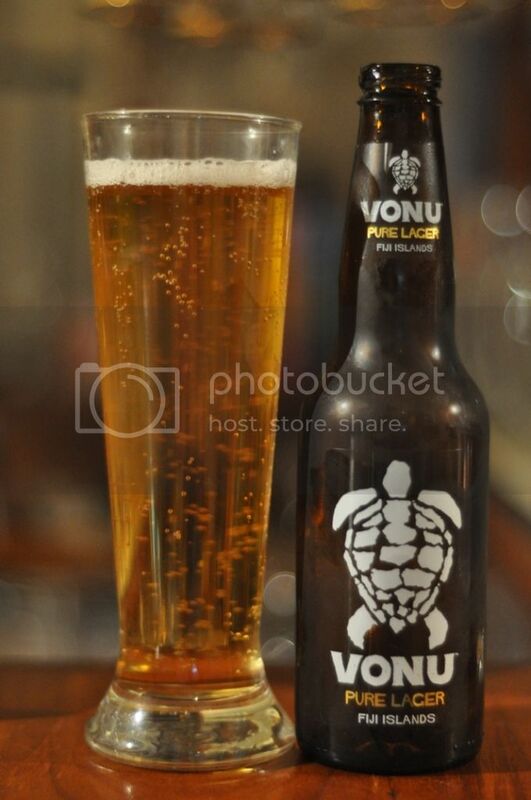 Vonu Pure Lager has a much better aroma than the beer looks, not that that is saying alot. The nose starts off with some quite sweet malts which are quite bready, but with a sweeter edge to them almost like a cake dough. There are some slightly spicy hops towards the backend of smell but they don't seem overly bitter. I'm quite interested to see what this one tastes like now. The taste is similar to the nose with the roles of the hops and malt reversed. By that I mean that the malts are less sweet than they seemed, although they are still sweet, and the hops are more bitter and pronounced. The body of the beer is a tiny bit sticky and the carbonation is a tad high, but I can still see this being an excellent lager to have on the beach in Fiji. After a bad start Vonu really picked up it's act and turned into quite a nice easy drinking beer. The only real downside to this beer was the appearance of the beer in a glass, however this is easily solved by just drinking the beer out of the bottle which looks pretty cool. Overall it's not a great lager, but it is relatively drinkable and would be refreshing in hot weather. If in Fiji it wouldn't be the worst beer to drink. i live in fiji and its an excellent beer to drink on a sweltering day at the beach..they also brew an 8 percent beer that has a lot more body, looks better and has a strong malt character with florals..
Good review...Spot on. I would buy this beer again.